Anti-Islam Protesters Plan Massive Rally In Leipzig, Germany : The Two-Way As many as 60,000 people are expected to attend the rally, in what could be one of the biggest protests in the eastern German city since pro-democracy marches a quarter-century ago. 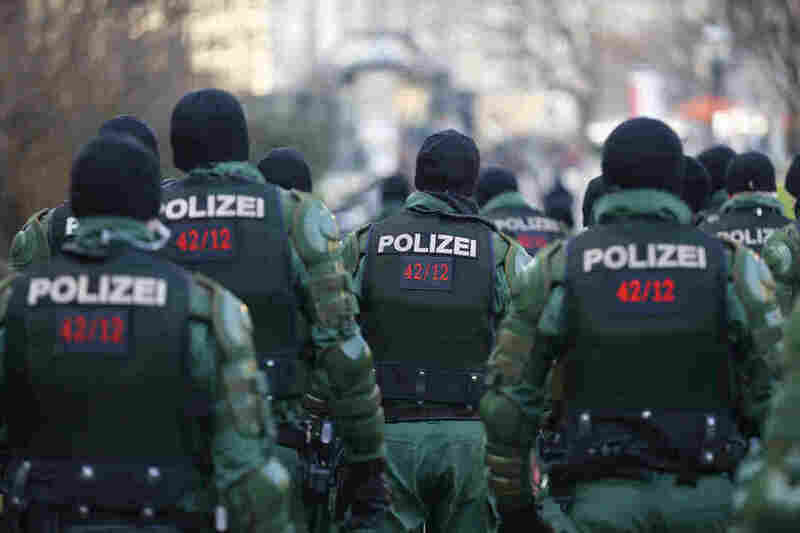 German police officers gather in preparation for a demonstration by members of LEGIDA, the Leipzig arm of the anti-immigrant movement PEGIDA. Organizers say as many as 60,000 people could attend an anti-Islamization rally in the eastern German city of Leipzig, in what could be one of the biggest protests there since pro-democracy marches a quarter-century ago. "Organizers of the anti-Islam protest say they have two goals: One is to show the German government they won't be silenced, just like the protesters who brought down the East German government 25 years ago. They also say they are snubbing Muslim extremists who are accused of threatening one of the Dresden leaders of the anti-Islam movement earlier this week." The protests — and counterprotests — in Dresden were canceled following threats. Soraya says about 4,000 police officers from around the region have arrived in downtown Leipzig to prevent expected clashes between the demonstrators and their opponents. Nineteen counterdemonstrations are registered with authorities for this evening. Deutsche Welle reports that a combined 100,000 people could take to the streets this evening. The protests in Leipzig are being organized by LEGIDA, an organization that is allied with PEGIDA, which is short for Patriotic Europeans Against the Islamization of the West. PEGIDA has marched in German cities with mixed success. The news from Leipzig comes as German prosecutors opened an investigation into one of the PEGIDA's leaders. Bild, a mass-circulation newspaper, printed a photograph of a man it said was Lutz Bachmann, 41, posing as Adolf Hitler, and other news reports said a man with his name had called refugees "animals" and "scumbags" on Facebook. Bachmann has previously denied he is racist, and said the picture of him posing as the Nazi leader was "a joke." "Preliminary proceedings have been opened," a spokesman for state prosecutors in Dresden told Reuters. "The suspicion is of incitement to popular hatred." Following the backlash, Bachmann told Bild he was stepping down as head of PEGIDA today. Germany is still struggling to come to term with its World War II-era actions. "Anyone who puts on a Hitler disguise is either an idiot or a Nazi," Deputy Chancellor Sigmar Gabriel, a Social Democrat, told Bild. "People should think carefully about running after a Pied Piper like this." As we have previously reported, Germany's political and cultural elite has condemned PEGIDA's rise with Chancellor Angela Merkel recently saying that "xenophobia, racism and extremism have no place in this country."